How does Khalni Garden + Weirding Wood work? So It is very tempting to the token generators with Legion's Landing Flip Gods' Eye, Gate to the Reikai and maybe add some land destruction. 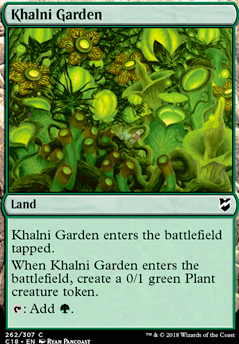 Khalni Garden Nissa, Voice of Zendikar (this is not as tempting due to double green). So if I play green I need to replace lands. Do you think I should pull out 3 mountains and one island? you should try lower cmc token producers or something like Khalni Garden with some spirit guides or rituals. First, we go RUG. 2x Khalni Garden . 4x Sprout Swarm and 4x Sprout instead of Hordeling Outburst and Spawning Breath . 2x See Beyond , 4x Serum Visions . Ditch the Search for Azcanta Flip, Rune Snag , and Remand . Shave an Izzet Charm , a Faithless Looting , and a Lightning Bolt for 3 more Polymorph s.
You're now playing 10 polymorph-able cards instead of 6, 8 polymorph effects instead of 5, and 12 cantrips, as before. Sure, you have fewer counterspells, but Remand is not a good card no matter what people say, and Rune Snag isn't that great, either. You can even buyback Sprout Swarm if you just need to keep chump-blocking. Is Indomitable Creativity going to be hard to cast in a 3-color deck? No, this is modern--you can play anything you want. 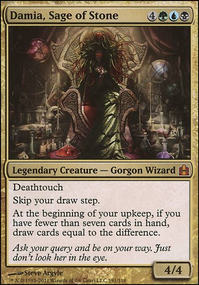 Green would also give you access to some better sideboard options, like being able to flashback Ancient Grudge . On an unrelated note, I feel like a deck like this could actually benefit from running an Electrodominance package that included Restore Balance due to not playing literally any creatures beyond one, but there just isn't any room for it, sadly. Still, though...you could play Wheel of Fate to pitch an emrakul you drew...you could play Ancestral Vision ...the possibilities are limitless, really. 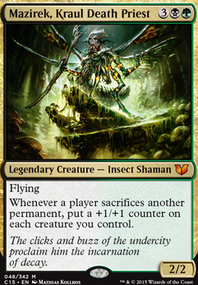 I like the elvish tribal that you're going for and ramping into the hydras/Hangarback Walker which make more tokens + experience counters but I feel like your deck needs more evasion/trample/haste to really hit home or even protect yourself from flying commanders. Maybe Akroma's Memorial? 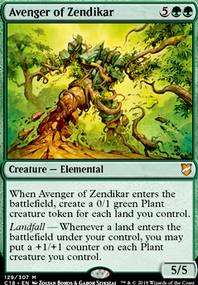 It follows the decentralized power mechanic, and I doubt you'll be short of mana late game.Ezuri, Renegade Leader can give be a finisher and give trample to elves. Herald of Secret Streams is also redonk with this deck. Yisan, the Wanderer Bard would be great in this low costing deck. Not only he would contribute to Ezuri's experience but he can bring friends. Only thing is he isn't an elf. Paradoxical Outcome would come in handy if there's a board wipe, your dudes are pretty cheap, so you can get the ETB triggers counted all over again. It's not great with +1/+1 counters but it's better than the creatures dying, and it can also be used on other nonland permanents. Alternatively, Inspiring Call is a less protective Heroic Intervention but the draws can get insane. It's a bit "win-more" though. Bramble Sovereign looks like it has some potential here, doubling your own dudes (and ETB triggers). Although, he can't copy the X costing creatures successfully. Bow of Nylea seems like a great choice for connecting with the damage (giving your attackers deathtouch) and can also spread some +1/+1 counters if you have spare mana. Pelt Collector is a great turn 1 drop. Beast Whisperer does everything you want. Animation Module is a great accelerator and can be used as a mana sink. You could upgrade your land base by a lot: Opal Palace, Path of Ancestry, Gateway Plaza, Rupture Spire, Transguild Promenade ... ditch Grotto and Shores. 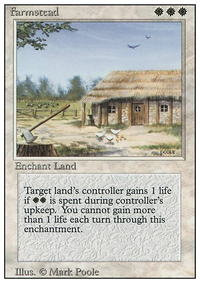 I'd consider running the best utility land for each color (Sejiri Steppe, Halimar Depths, Bojuka Bog and/or Mortuary Mire, Teetering Peaks, Khalni Garden) in combination with Crop Rotation as well. Putting in 4x Khalni Garden makes a turn 2 Emy with just two rituals. I had good testing with those four, two additional Magma Jet, and a Cathartic Reunion, replacing them for the four Crimson Wisps, two Expedite, and one Hordeling Outburst. I was discarding wisps turn 1 if I had a possible turn 3 Indomitable Creativity hand anyway, and having 25 land doesn't seem to bother a deck with this much digging. The little bit of extra interactivity from Magma Jet after already having a creature to target from a turn 1 plant token helps.